I’m wishing you a very Merry Christmas, or other Happy Holidays, and all the best for 2019! 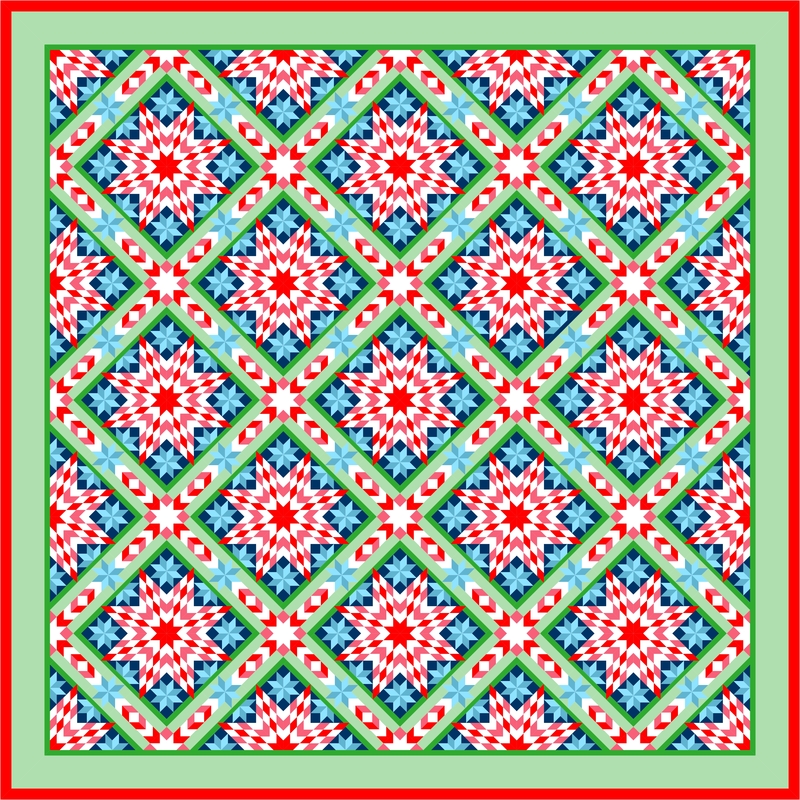 I have not done much blogging, EQ-ing or quilting in 2018, but I felt I had to at least put up a Christmas quilt design. And if you have followed me for a couple of years, you know my Christmas quilts usually have stars. And, I have a problem with the traditional Christmas red and green! It has to have at least a third color, or be a very soft green or something. 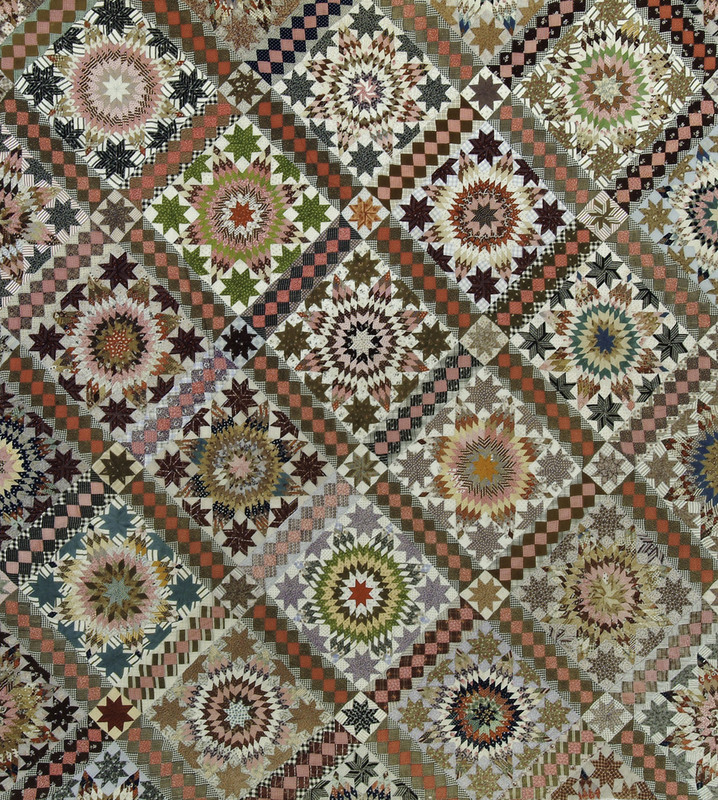 This design is inspired by a spectacular, scrappy antique quilt from the collection of the Grand Rapids Public Museum in Michigan, USA. I think I first saw it in a blog post by Barbara Brackman, and I saved a picture of it. 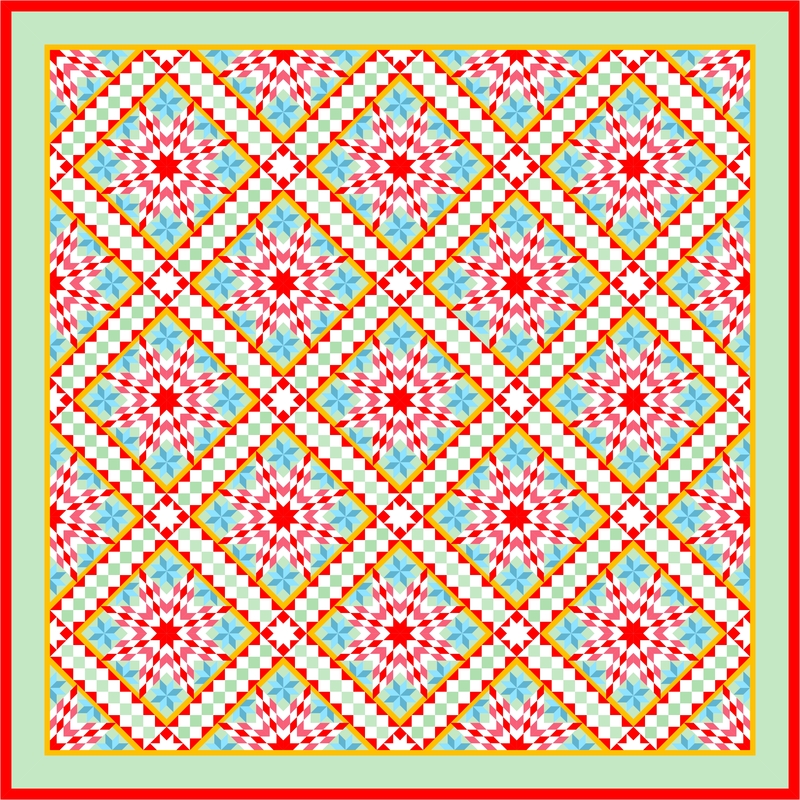 Edyta Sitar did a reproduction pattern, which recently also was in Quiltmania issue 128. While I love this quilt, I would not make an exact reproduction. 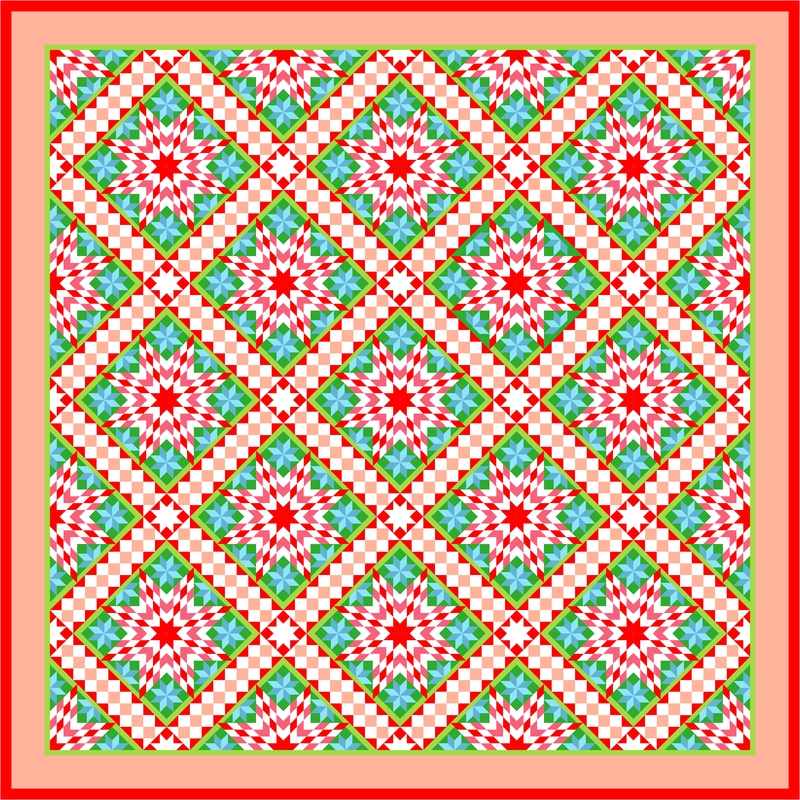 First, I prefer symmetrical quilts. Second, the relative proportions of the differently sized star points (diamonds) did not look harmonious to me. Third, and perhaps, most important, not all sizes of diamonds are available as Inklingo shapes. So, I tried to remedy all of that in EQ8. I came up with a design that is based on one size diamond only, using the 3 inch Inklingo LeMoyne Star shape collection as my starting point. The original star block is 12 inch [30,48 cm.] with 5 rows of diamonds, and 3.5 inch [8,89 cm.] stars in the corners. My design (center measuring about 64 x 64 inches [163 x 163 cm.]) has four rows of the 0.88 inch [ca. 2,2 cm.] diamonds, which also makes the large star 12 inch. By adding 0.5 inch [ca. 1,3 cm.] strips to the outsides of the smaller stars in the corners, I could use the 3 inch [ca. 7,6 cm.] star there, too. The stars in the corner stones are also 3 inches. I drafted both the original sashings, and a sashing block of my own design, using the 0.88 inch diamonds there, too. You would have to make it so that you add about 1/8 of an inch [2 millimeters] somewhere along the length of the 12 inch sashings. I think that’s doable by piecing slightly scant seams. The original sashing can also be made with Inklingo shapes, if my mushy brain is correct. It uses 1.5 inch QST’s and 1.06 inch squares. Check the Index of Inklingo Shapes for availability. Wow says it all! Happy New Year and happy quilting! Thank you Sara! I wish you the same. I hope to be able to devote more time to quilting in 2019! Thank you! I am glad you liked it, and appreciate you taking the time to write a comment! Happy New Year, Annika! Your design is wonderful and I love that you adapted it to Inklingo. Brilliant! Thank you Linda. Happy New Year to you, too! Annika——-Merry Christmas to you as well. Another beautiful design to enjoy. Merry Christmas to you, too, Annika! Yes, I prefer the first one, too. I think it has the most sparkle to it, because of the contrast, and the sashing design adds bit of a folksy look.